If you are looking for the best size-friendly baby carrier, one that will fit both you and your baby comfortably, you’re in the right place! 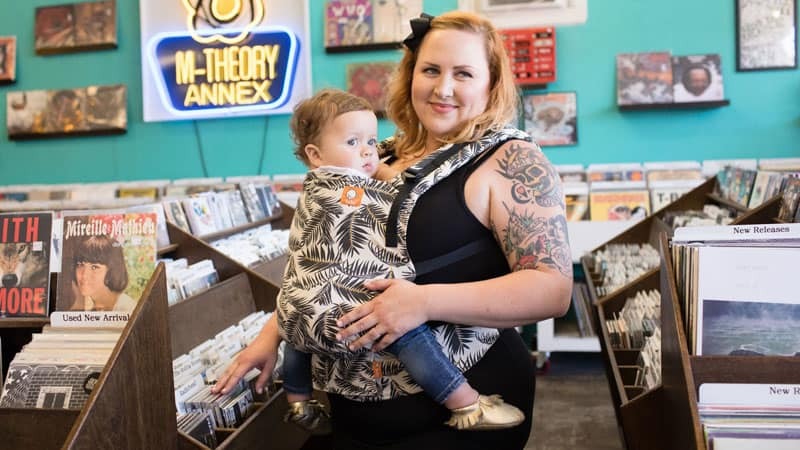 Many plus size wearers are concerned that baby carriers won’t fit them – we get a ton of questions from customers who are concerned about finding the best baby carriers for plus size bodies and whether the carrier they have their eye on will work for their body type! Share essential tips and suggestions for choosing the best baby carrier for plus size wearers, based on more than 15 years of personal experience of working with different babywearers of all shapes and sizes. 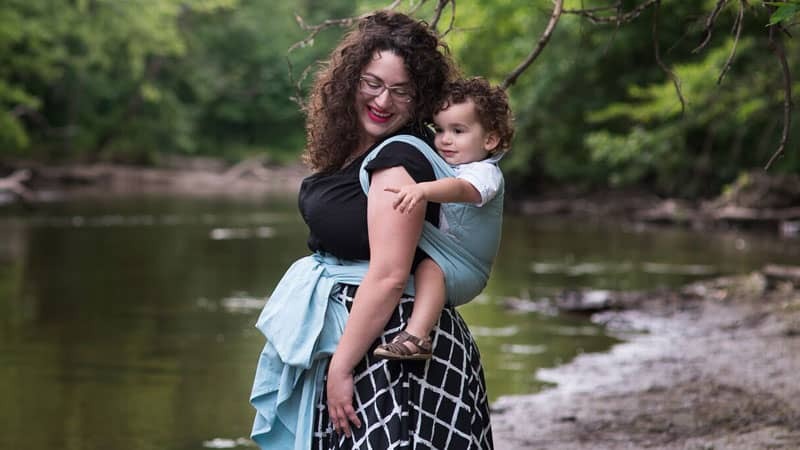 Go over the different aspects of choosing a baby carrier that plus-sized caregivers should pay special attention to, and how these features can impact your day-to-day babywearing life. 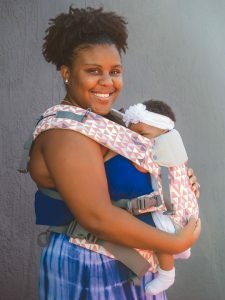 List the best baby carriers for Plus Size Moms and Dads looking to wear their newborns and older babies in 2019. My plus sized customers often share with me that it can be hard to find slings and carriers that fit comfortably. I know how frustrating and discouraging it is to feel that your body type is limiting the options available to you! Everyone wants to find a carrier that fits on their body, and is also comfortable, safe and fashionable! Fortunately, we are seeing more and more options on the market and CMA carries a wide selection of size-friendly carriers. 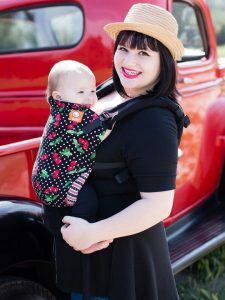 I am often asked what is “the best” baby carrier for plus-size wearers. It’s important to acknowledge that all body shapes are different and not all “plus size” bodies are the same shape and size! 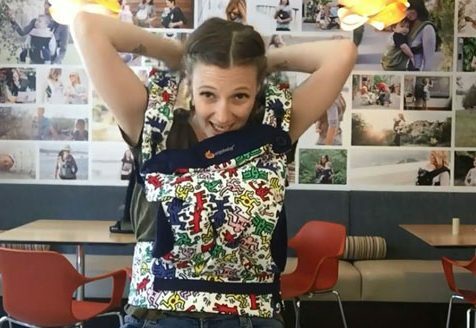 Baby carrier fit is also a personal thing and everyone has their preferences. So whether you are plus-size or not, you may need to try a few carriers to find the one you love. There are four basic types of carriers. All four can be comfortable for plus size wearers! The first step in choosing a carrier is to choose which type of carrier you want to focus on. Then, you can move on to the tips in the baby carrier category you are interested in! Wraps: long pieces of fabric that get wrapped around the body. Versatile, cuddly and the highest learning curve. Ring Slings: long pieces of fabric that get looped over one shoulder and tightened with rings. Fast and easy to use, great for newborn cuddles and as hip carriers for older babies. Buckle Carriers: a catch-all category for carriers that fasten with buckles. Includes Soft Structured Carriers, which are the most widely recognized type of carrier. These have a padded structured waistband and padded shoulder straps. This category also includes Onbuhimo carriers. Meh Dai: a cross between a wrap and a buckle carrier, meh dais tie rather than buckle but are easier to learn than wraps. Plus size wearers can choose from ANY of these categories – nothing is off limits! What Carrier Types Should You Consider? All of them! Being plus-sized does not mean you are limited to one type of carrier! We offer many size-friendly carriers in all carrier types! The type of carriers you pick should be based on your budget and what you will be using the carriers for. If you are looking for one single carrier, choose a two-shouldered option. This means looking at a buckle carrier, wrap or meh dai. If your budget stretches to more than one carrier, definitely add a ring sling! 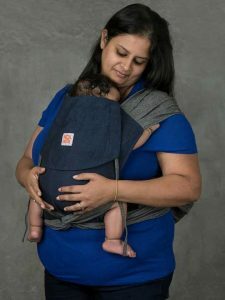 They are a great complement to a two-shouldered carrier and are awesome for easy ups and hip carries (with older babies). Straps: Comfortable straps are key. The straps need to be long enough to fit, but they also should be either wide enough or sufficiently padded so that they comfortably distribute weight and don’t dig into your skin. Pay attention to the placement of any buckles as well, and whether there is a chance of the buckles digging. Waistband: if the carrier has a waistband, it should be fully adjustable for the plus size wearer. Breathable Fabrics: if you run hot, you’ll want to look for carriers in breathable fabrics. 100% cotton and linen fabrics are breathable and cool. Many carriers also have mesh panels and other that add to the air flow in and around the carrier. Adjustability: to be comfortable, the baby carrier you choose should be adjustable to your needs. Straps and waistbands usually adjust, but you also want to make sure that you can reach the pockets, easily put the hood on and off and reach any straps or buckles that you need to adjust. Acknowledge up front that there may be some trial and error in finding the right buckle carrier. 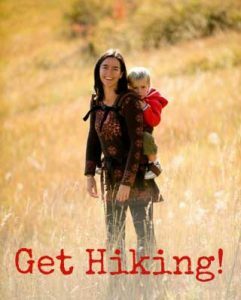 The most popular type of baby carrier can also be the most challenging one if your body type is different than the “standard” size. Don’t only look at the length of the arms straps and waist belt. Also consider the padding on the carrier and whether it’s placed to be most comfortable for you. Look for Perfect Fit Adjustor buckles (PFAs) add extra adjustability to a carrier – you can open them all the way to lengthen the padding or cinch them down to help move buckles to comfortable spot that doesn’t rub. Look for dual adjust side buckles that allow you to move the buckle around to a more comfortable spot. These buckles also allow you to adjust the straps by pulling forward rather than back, which is easier for all wearers. 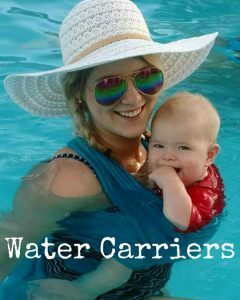 My top recommended carrier for plus size moms and dads. 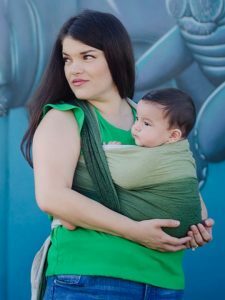 The Tula FTG has a lightweight cotton body that is floppy and moldable so it hugs your baby to you. The Tula Free-to-Grow knocks it out of the park in so many ways, including comfort for plus size bodies. This is my top recommended carrier when asked about the best baby carriers for plus size wearing. 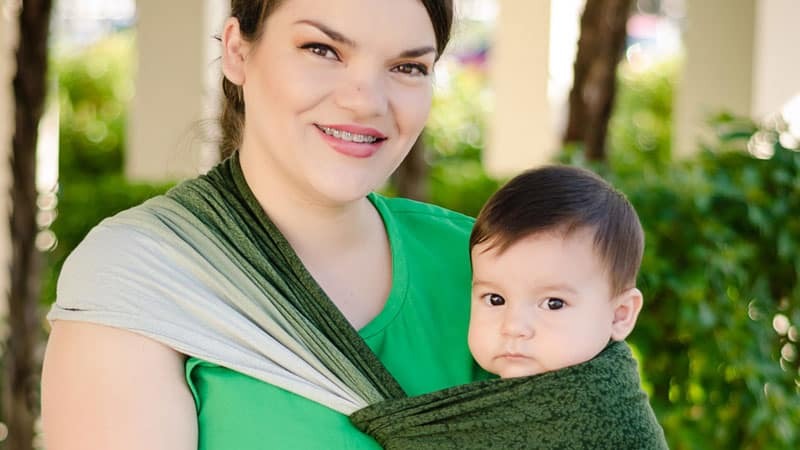 The Tula FTG has a lightweight cotton body that is floppy and moldable so it hugs your baby to you. It is reasonably cool to wear and you can also get a “Coast” version that has a mesh center panel for additional airflow to baby’s back. This carrier has three width adjustments and several height adjustments so your baby can be properly supported as s/he grows. With shoulder straps that extend to 50″ and a waistband that extends to 57″, this carrier is a good fit for plus size wearers. Comes in a wide range of colors and prints. The Tula Free to Grow does not face baby forward. If this is important to you, you may want to consider another carrier. Also, the pocket on the front is small and can be a bit hard to access as baby gets bigger. Single adjust buckles are attached at the end of the shoulder straps, which means you have to have some arm flexibility/mobility to get the carrier on and off (for some suggestions on making it easier to get this or any buckle carrier on by yourself, go here. 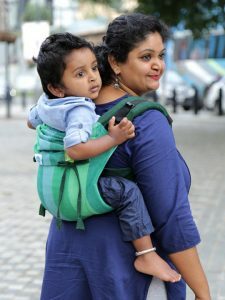 Ergonomic carrier that faces baby forward, can also be worn on your back. Great fit for plus-size! 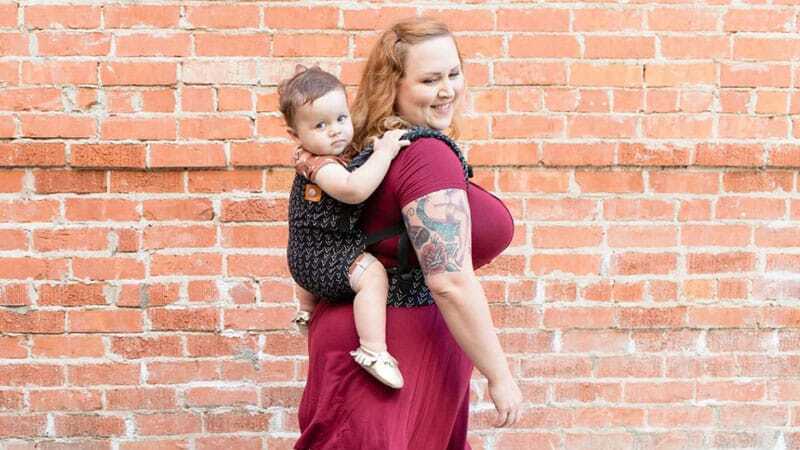 Tula carriers are favorites of our plus size customers, and this new Tula Explore offers the forward-facing carry at last! The fabrics on this carrier are soft and the design of the seat means this carrier supports your child is an ergonomic position when facing forward, as well as in the standard front facing and back carries. 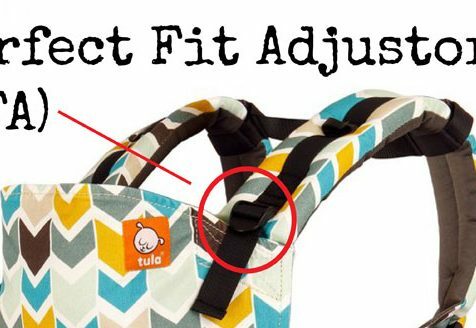 This carrier offers several adjustments so that it grows with your baby and can be used from birth to toddlerhood (7-45 bs). It is easy to switch between positions. The shoulder straps (up to 54″) and waistband (up to 57″) on this carrier are generously sized. The light padding on the body makes this carrier warmer than some others (such as the Tula Free to Grow). The pocket on the front is small and can be a bit hard to access as baby gets bigger. Single adjust buckles are attached at the end of the shoulder straps, which means you have to have some arm flexibility/mobility to get the carrier on and off (for some suggestions on making it easier to get this or any buckle carrier on by yourself, go here. Easy to use, with straps that cross on your back or can be worn backpack style. The Gemini has a bit less adjustability than some of the newer forward-facing carriers on the market. The body of the carrier has two height settings: one with the headrest up and one with the headrest down. There are also just two settings on the base. This carrier doesn’t have an additional hood. Also, know that the padded body of the Gemini offers support but is also a bit warmer for baby. The “Cool Mesh” version is a lot cooler but has shorter straps and waistbelt (54″). Awesome carrier for babies 6 months and up (or younger with additional infant insert). A plus-size customer favorite for comfort and ease of use. This carrier requires an additional infant insert for use with small babies (under 15 lbs) so it’s best for use with babies 6-7 months or older. Softness, flexibility and a great price for a buckle carrier! A great choice for wearers on a budget or who want a carrier that softer and less heavily padded. Best for babies 6 months and up. The Soul Carriers are so soft and floppy! These lightweight carriers come in gorgeous all-over fabrics, including cushy wrap fabrics, linens, and cottons. The waistband and shoulder straps are thin and soft – but still comfortable – and they mold to your body more than the straps of other carriers. Soul’s carriers are less expensive than some comparable carriers on the market, but they are still great quality. Perfect Fit Adjustors make breastfeeding easier and also offer an additional room in the carrier. Soul’s Full Buckle carriers have some of the longest straps available – the shoulder straps are and the waistband is 64″. Additional padding under the buckles means they are less likely to dig. Last but not least there are dual-direction adjuster buckles on the straps which allow there to be minimal webbing (the narrow black strap) against your body. 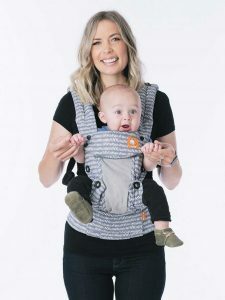 This carrier is best for babies over 6 months or so, and at least 15″ It does not have any pockets and there is no spot to store the attached hood, although you can cinch it up. Quick and easy to use, an onbuhimo is awesome for wearers with older babies who don't want anything wrapped around their waist. The Soul Onbuhimo is an awesome option for when you want something for quick ups with your older baby or toddler. This carrier doesn’t have a waistband so there is no constricting fabric around your waist. Onbuhimos are one of best carriers for plus size wearnig if you don’t love having anything round your waist. These carriers are a great price, too. Onbuhimo carriers are not suitable for wearing newborns or smaller babies, they are best for babies 6 months and up. They are designed to be worn high on your back, which is a different feel than the average buckle carrier – it can take some practice to get the positioning correct and comfortable. If you love the ease of use of a buckle carrier, but find the buckles uncomfortable, a meh dai could be perfect for you. These all-cloth carriers offer a soft, natural-feeling carry with no buckles, but are easier to use than a wrap. Consider wider straps which distribute the weight well over your shoulders. Wrap-style straps are popular for their comfort and for being less diggy on the shoulders. The Kol Kol is a budget-friendly meh dai for wearers wanting a soft, natural feeling carry - no buckles or stiff padding! Meh dai carriers are buckle-free fabric carriers that offer a soft, natural feeling carry. They are tied on with knots, so the Kol Kol can be tied in a variety ways – this allows you to vary up the way it sits on your body. Wide, wrap-style straps spreads out the weight so the straps don’t dig into you. The Kol Kol Meh Dai has a nifty adjstment at the base so you can wear it with an infant up to toddler (to 33 lbs). Two straps lengths available. Value priced. This carrier ties rather than buckles and has long straps which can drag on the ground when putting it on and off, if you’re not careful. This carrier doesn’t have pockets although it comes packaged with a pouch that you can carry on the strap. Wraps are a fabulously size friendly carrier. Because they are simply a long piece of fabric, they are infinitely adjustable around your curves. 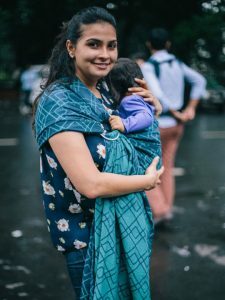 Wraps with some stretch in them are great for those new to babywearing – they stretch and conform around your body with ease. Many of these wraps are one-size and can easily fit bodies up to 2x. Woven wraps are sized, so it’s possible to find one that works for every wearer. If you re new to woven wraps, choose a 100% cotton, thin-to-medium weight wrap in a colorway that you love. Wrap your baby in cocoon-like softness. Cotton with bamboo to keep you both cooler. There are a lot of stretchy wraps on the market, but the Moby Evolution stands out by with its bamboo fabric content, which makes it thinner and cooler than the classic Moby and than other stretchy wraps out there. At 5.5m, this wrap is long enough for most plus size wearers. 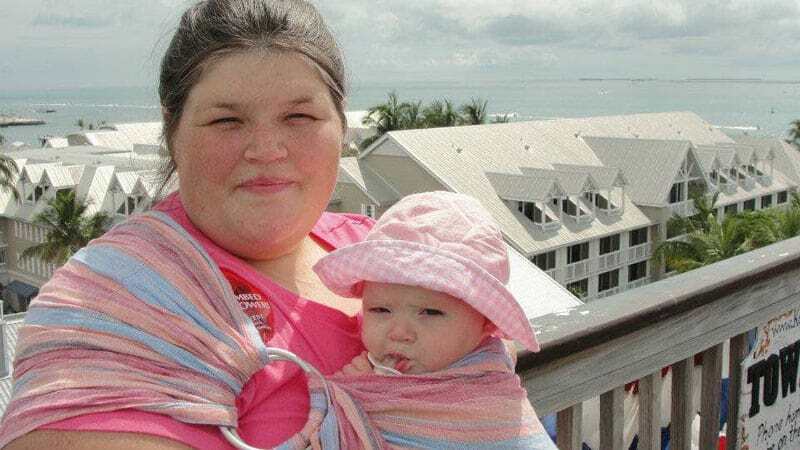 We consider stretchy wraps to be one of the best carriers for plus size wearers with a newborn. 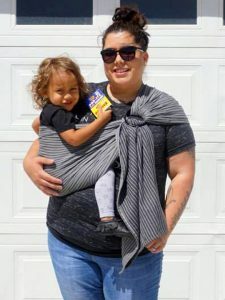 This carrier has a lot of stretch to it which makes it lovely for wearing small babies but most people find that it is too stretchy to provide needed support once baby hits 20 lbs or so, so it’s best as a newborn wrap. This wrap is not recommended for forward-facing carries or for back carries. Soft and versatile wrap to take you from birth to toddlerhood. Super soft for newborn wearing, but supportive enough for older babies & toddlers. 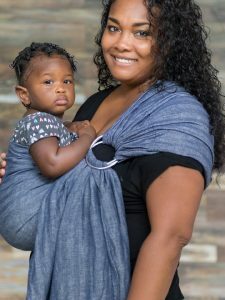 This is my favorite stretch wrap – it has enough stretch in it to make it easy to use (and to pop baby in and out after it’s tied on) but is also supportive enough to wear in most positions that a woven wrap can be used in (including forward-facing and back carries). Unlike many stretchy wraps, the Wrapsody Hybrid can be used well into toddlerhood. It is also reasonably thin and light. At 5.5m, this wrap is long enough for most plus size wearers. Like all wraps, there is a lot of fabric, which can be overwhelming at first. These are gorgeous, hand-dyed and batiked wraps, but the look is not for everyone. Easy, breezy and beautiful, in lengths to fit most bodies! This woven wrap is super lightweight and cool! Suitable from birth through toddlerhood, this wrap could be the only carrier you need! Great price for a woven wrap. The longest length is 6.0m which should fit up to size 28. Like most woven wraps, this wrap takes some breaking in to get soft and some practice to learn to use. It is not as cushy as more expensive woven wraps. Some customers report that you have to wrap carefully to avoid pressure points with heavier kids. Consider sling length. 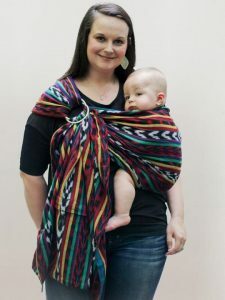 Generally, longer is better in a ring sling because the additional length can just be wrapped around the rings if needed (or you can easily get it tailored to fit). 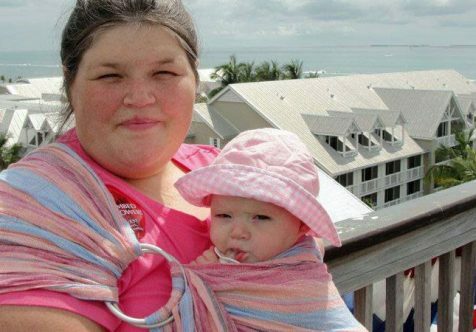 If you are sized 16 or under, a standard size sling (72-78″) may fit. If you are over size 16 (or want a longer tail), look for a sling that is 80″ or longer. Consider shoulder type. If you have rounded or sloping shoulders, you may prefer a sling that spreads wide, such as a gathered shoulder. If you have narrow shoulders, you may prefer a narrower shoulder such as the Maya Wrap Lightly Padded Sling. Shoulder padding can also make these carriers more comfortable and the narrower shoulder is less restrictive of your arm movement. If the ring sling has a pocket on it, this may reduce the usable length of the sling. Beautiful, comfortable and with sizes to fit everyone! Gorgeous and affordable ring slings are so soft right out of the box so you won’t need to do much (if any) breaking int. Soul slings come in 4 lengths, so you are guaranteed to find one to fit (the size 4 wrap is 93″ long, which is very long). Gathered shoulder is easily adjustable. Option of cool and supportive linens or cushy woven cotton. Like any ring sling, this carrier is one-shouldered so all your baby’s weight is on the one shoulder. And like most single layer ring slings, these have a lower weight range than other carriers. Soul recommends them for children up to 33 lbs. Slings may shrink a bit during washing. Linen + cotton woven together to make a super supportive and beautiful wrap. Long length fits all! 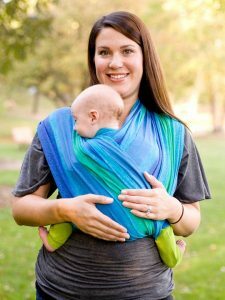 A super supportive ring sling that will take you all the way through toddlerhood. 50/50 cotton-linen blend offers great support and is gorgeous besides. Option of ring colors is a fun touch. 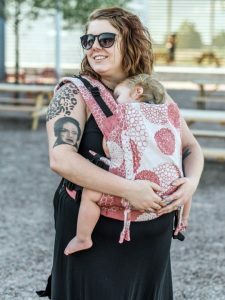 This one-size carrier is very long at 90″ so should fit most plus size wearers with length to spare. Weight limit is 45 lbs which is higher than many ring slings – so this is definitely toddler-worthy! This fabric is stiff out of the box so will need washing and steaming to break in. Like any ring sling, this carrier is one-shouldered so all your baby’s weight is on the one shoulder. This ring sling hit all of my must-haves: budget-friendly, size friendly, and easy to care for! If you’re in the market for a quick everyday carrier that will take you from birth-toddlerhood this is it! Easy to use sling in lengths to fit all bodies! The Maya Wrap sling’s pocket does limit the usability of the length. Long length and supportive fabric make this a g great value choice for plus size wearers. Budget carrier price without the budget carrier feel! Woven cotton has a wrap conversion feel that other slings in the price range don’t. The fabric is soft and moldable and supportive enough for toddler-wearing. 85″ prior to washing and 81″ after washing, so long enough to fit most plus size wearers. 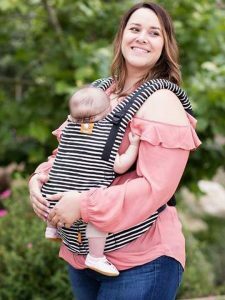 For a budget price, this is one of the best baby carriers for plus size, as far as ring slings go! This sling is only available in three colors. Still confused about choosing the best carrier for you? My Free Baby Carrier Prescription Service Can Help!